I think there must be something special between a mother and her son. Or maybe it's a special bond between a parent and their first-born child. Or maybe it's because I missed out on the first 2 1/2 years of his life. Whatever it is, the connection I have with Judah Abebayehu is indescribable. 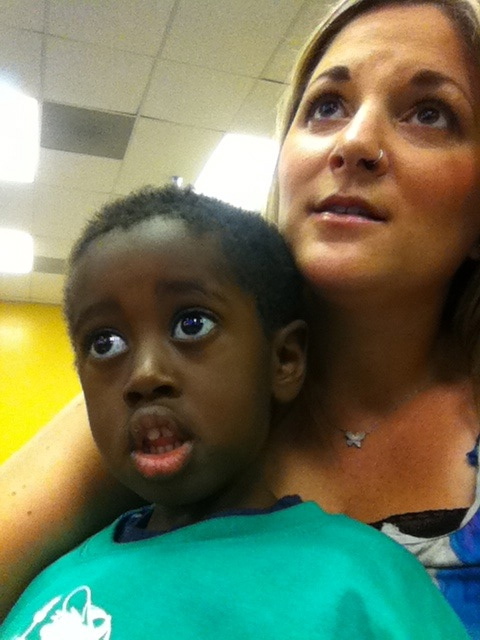 Last month I had one of "those moments" as an adoptive mama. If you have an adopted child, you know these dreaded moments well. It's a moment where one of the losses that accompanies adoption comes out of no where and strikes you down. It's a moment when you thought everything was finally "normal" in your family and then a memory or reality hits you like lightening and you are forced into another level of grief for your child. After 2+ years of those moments, I've finally accepted "those moments" will happen for the rest of our lives. It's part of the reality of adoption. I was driving home late from work one night. I hadn't seen the kiddos that day except for a few minutes in the morning, so I was just thinking about their day with daddy. Then, it hit me like a ton of bricks and hot tears filled my eyes. I have mothered Judah for nearly the exact amount of time that his birth mom mothered him. Two years and one month...almost to the day. Finally, I have been Judah's mommy for as long as the woman who birthed him into this world. Exiting the highway toward our house, tears poured down my face as I once again grieved his birth mother's loss, Judah's trauma, and our lost time with him. But I also grieved for the first time the thought of losing my son. I cannot imagine giving Judah up after caring for, nurturing, and loving this little boy. After feeding him thousands meals, giving him hundreds of baths, brushing his teeth, changing endless diapers and teaching him how to go potty in the toilet, teaching him how to count to 10 and what shapes and colors were, giving him a bazillion kisses and telling him "I love you" a quadrillion times, how could I let him go forever??????? It was an unfathomable feeling. It leveled me to consider - once again - his birth mother's sacrifice. I met Judah's birth mom. She was young. She was beautiful. I'm quite certain she loved him. I'm sure she thinks of him every day and wonders if he is loved and cared for. She didn't give him up because she didn't love him. She gave him up because she could not keep him. And therein lies the paradox of adoption. A beautiful life redeemed and restored and given hope, and another side of the story that continues to bear pain. He still loves sitting on my lap and learning.